"Diversified Experience-- Justice Academy Faculty Members come from Across the Nation"
A photograph of the El-Khouri family's visit with Vice President Hubert Humphrey at The White House, Washington, D.C. in 1966. Joseph El-Khouri and Humphrey met in Minnesota in the 1950s after El-Khouri's immigration to the United States. Tags: 1960s; 1966; Anthony El-Khouri; Barbara El-Khouri; Catherine El-Khouri; El-Khouri; Families; Family Vacations; George Maron El-Khouri; Hubert Humphrey; Joseph Maroun El-Khouri; Mariam El-Khouri Gerber; Marsha El-Khouri Shiver; Rose Isaac El-Khouri; The White House; Theresa El-Khouri Martin; Washington, D.C.
A snapshot taken on Christmas, 1963, of Joseph El-Khouri, Rose El-Khouri, and a selection of their children. Interview with George El-Khouri about the legacy of his father Joseph El-Khouri. Flyer for the Retirement Reception of George Maron El-Khouri, organized by his cowokers and held at the North Carolina State Bureau of Investigation Headquarters. Back Row Right to Left: Joseph Maroun and Rose El-Khouri; Middle Row second from Right: Marsha El-Khouri Shiver. Others in Picture: George, Theresa, Mariam, Barbara, Anthony and Catherine El-Khouri. 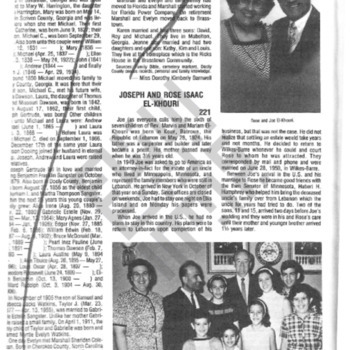 Joe and Rose El-Khouri, surrounded by their seven children and a number of their grandchildren.